As a professional speaker, photographer, and award-winning author, I am grateful for the opportunity to help others maximize the power they have within. At the age of seven I had my first serendipity, although I didn’t realize it at the time. I was extremely shy and decided I wanted to overcome my fear of communicating. Since then I have challenged myself every day to speak up, write and conduct presentations and overcome my fears. My persistence paid off; after enjoying a successful 28-year career as a marketing and training executive, I founded Simply Put LLC, specializing in presentations to help people communicate more effectively and live life rather than react to it. Clients hire me locally, regionally, and nationally when they are ready to help their audience improve communication skills, teamwork, attitude, job satisfaction, and maximize their happiness and capacity, personally and professionally. 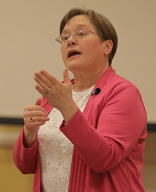 Many clients have said, “Lee is the best speaker we’ve ever had!” I am known for bringing out the best in people by combining real-life stories, vivid imagery, and conversational techniques that connect with the audience in a meaningful and productive manner. Striving to achieve my maximum capacity, I also work with my husband, Tom, using our words and photographs to inspire people. We have documented life, human and wild, in two quintessential Maine homes, a lighthouse on the coast and a log cabin in the forest, resulting in the publication of two books. 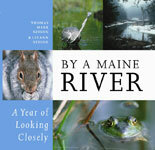 The first is the award-winning, Our Point of View-Fourteen Years at a Maine Lighthouse, featuring Marshall Point Lighthouse in Port Clyde, and the second is By a Maine River – A Year of Looking Closely, which explores the natural beauty found in the backyard of our log cabin in the woods. I credit Tom for opening my eyes to the natural world; Mother Nature opened my heart. For 26 years I have been inspired by Tom’s art as a professional wildlife and nature photographer, and now share the art of photography and love of the natural world with him. I find much joy and peace in capturing and sharing Maine’s exquisite beauty in my Simply Maine series. In addition to using my photography in presentations, I also have a series of notecards and posters that are appropriate for workplace inspiration, all of which help inspire people to achieve contentment. Yippee, it’s a new day!